There are 18+ different colours. Neon Orange (bright), Neon Yellow (Very bright), Highlight Yellow (Brighter), Tomato Red (Strong Red), Neon Red (lighter red), Mint Green, Forest Green (Dark Green), Neon Green (bright lime green), Aqua,Teal, Neon Blue, Navy Blue, Light Blue, Neon Pink (very bright),Berry (Light Purple), Purple (Darker Purple), Black, White,Gold, Silver and Maroon. Peel & seal system is tamper proof and non transferable. 1" x 10" - Ideal for events - ideal for security also identification and visitor control at events and functions. Tyvek wristbands are made of fibres that are tear and stretch resistant while at the same time being waterproof meaning that they can be used for a wide variety of uses including swimming pools and water attractions. The wristband is easily applied to the wrist using a high quality adhesive strip which makes it fully adjustable, comfortable to wear, and ideal for children. 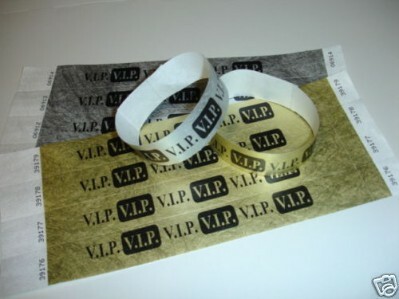 Many of our customers use tyvek wristbands for parties, festivals and groups. Simply place round the wrist of your customer, make tight enough so it isn’t loose, then pull off the glue protector and stick. The peel & seal system is tamper proof and non transferable. A “www” pattern is disrupted when the ends are prised apart. The band cannot be removed from the wrist without tearing the perforated chevrons; that is in order to prevent them being passed our through a window to friends and re-used. They are strictly one-use only. Your door-persons should fit them to clients as they enter, in order to avoid them being fitted so loose that they can be slipped off. Large prints/Logos may be subject to additional costs and if your chosen wristband colour is out of stock we will replace it with the nearest colour. All uk orders over £39 is sent as special delivery or signed for / recorded mail. Special Delivery orders will need to be signed for, so choose a suitable confirmed delivery address. Delivery abroad takes longer. Within Europe allow 5-8 working days for normal Airmail and 4-6 days for Airsure (not available for all countries in Europe).Worldwide Airmail allow at least 8+ days for delivery.